About 30km from Phan Thiet (Phan Thiết) City, Vietnam (Việt Nam), Ta Cu Mountain is located in Thuan Nam Town (Thị trấn Thuận Nam), Ham Thuan Nam District (Huyện Hàm Thuận Nam), Binh Thuan Province (Tỉnh Bình Thuận). 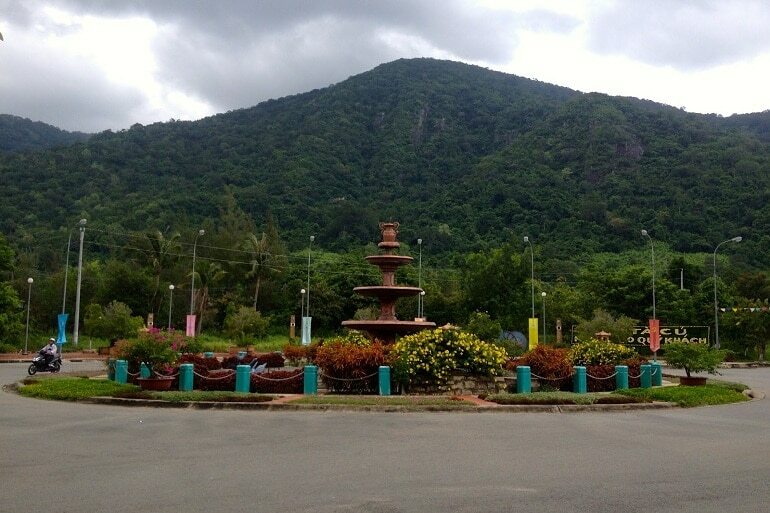 It is a famous tourist area with beautiful scenery, green trees, blooming flowers, and mountains. The highlight of Ta Cu is its peak. Located at an attitude of 649 meters above the sea level, the tourist site Ta Cu Mountain covers over 250.000 m2, including mountains, forests, and diverse ecological marine population. Exploring Ta Cu Mountain is definitely a worthy thing to do in Phan Thiet. If you are planning to visit Phan Thiet – Mui Ne in Vietnam, do not miss the Ta Cu Mountain. However, first and foremost, check out our details about experiencing on traveling to Ta Cu Mountain so you will have the best preparation. How To Get To Ta Cu Mountain? 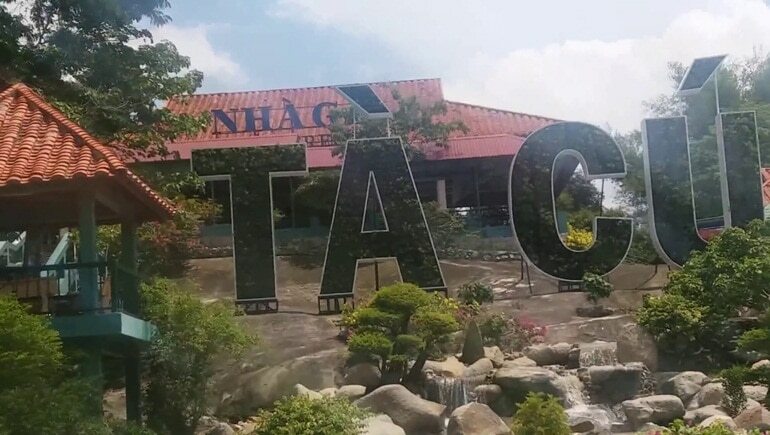 With the convenient location, from Ho Chi Minh City (Thành Phố Hồ Chí Minh) or Vung Tau (Vũng Tàu), go through Binh Chau (Bình Châu) Hot Spring, Thay Thim Palace (Dinh Thấy Thím), and Dien Khe Ga Cape (Mũi Điện Khe Gà), you can easily get to Ta Cu Mountain. Climb over 1000 stair steps: If you choose this way, you will need about one day to reach the mountain peak. It is suitable for those who are adventurous, have good health and are ready to sleep in the mountains. Take the cable car: This way will save you time as it only takes about 15 minutes to reach the mountain peak. The cable car system is 1.600m long, 505m high with 35 automatic collapsible cabinets and can serve 1.000 tourists per hour. If you choose this way, you will have a chance to enjoy, admire the old green trees and blooming red flowers, and listen to the birds singing. From above, you can see clear Ham Thuan Nam Sea (Biển Hàm Thuận Nam) and Ke Ga Lighthouse (Ngọn Hải Đăng Kê Gà) of more than 100 years old. They will make you realize how beautiful Phan Thiet is. Where To Stay In Ta Cu Mountain? Price: 550.000VND / room / 12 people. Extra bed: 30.000VND / person. If you go in groups, you should choose this room type. It is quite airy, however, it does not have TV, air conditioner, and water heater. Price: 250.000VND / room / 3 double beds. Extra bed: 50.000VND / person. This room type is equipped with a TV, air conditioning, and water heater. Its space is also very cool. Price: 250.000VND / room / 2 double beds. This room type is also equipped with a TV, air conditioning, and water heater. Princess d’Annam Resort & Spa: It is located in Hon Lan, Tan Thanh Commune (xã Tân Thành), Ham Thuan Nam (Hàm Thuận Nam) District, Ke Ga Cape (Mũi Kê Gà), Phan Thiet city, Binh Thuan province (Tỉnh Bình Thuận). Room rates are from USD 139.50. Green Organic Villas: It is located in Tien Phu (thôn Tiến Phú) village, Tien Thanh (Tiến Thành) commune, Phan Thiet (Phan Thiết) city, Binh Thuan (Bình Thuận) province. Room rates are from USD 74.06. 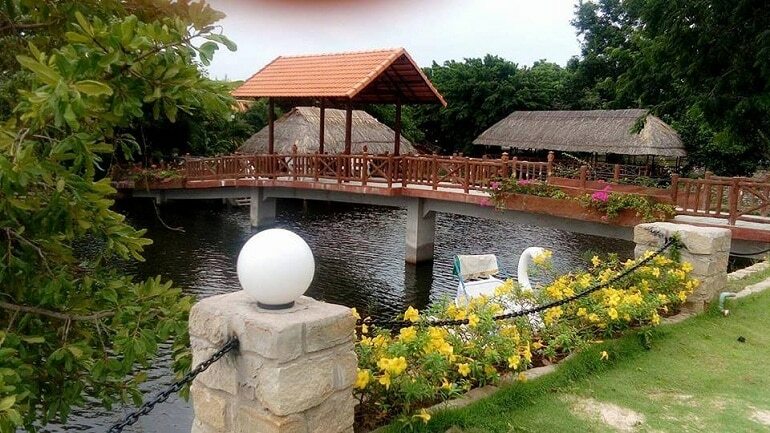 Eco Spa Village: It is located in 719 Road, Tan Thanh Village (Xã Tân Thành), Ham Thuan Nam (Hàm Thuận Nam) District, Tien Thanh Beach (Bãi Tiến Thành), Phan Thiet. Room rates are from USD 36.11. Doi Su Resort: It is located in Thuan Quy Village (Xã Thuận Quý), Ham Thuan Nam District, Phan Thiet city, Binh Thuan Province. Room rates are from USD 37.27. PT Family Resort: It is located in Lac Long Quan (Lạc Long Quân), Tien Thanh Beach (Bãi Tiến Thành), Phan Thiet city. Room rates are from USD 28.35. What Are Attraction In Ta Cu Mountain? If you choose to explore Ta Cu Mountain by climbing over 100 stair steps, on the way climbing thousands of stone steps, you will go through Long Doan Pagoda (Chùa Long Đoàn) and Linh Son Truong Tho Pagoda (Chùa Linh Sơn Trường Thọ). In spite of undergoing a few times of renovation, this pagoda has still kept its ancient distinctions like curved roof tiles and a couple of dragons which flank the moon tingled with the moss. From the top of Ta Cu Mountain, climb 100 more steps, you will be able to admire Linh Son Truong Tho Pagoda featured with statues, towers, shrines, and ancient stone stairs. Most notably, this pagoda is also extremely famous for the largest Buddha statue in Southeast Asia. 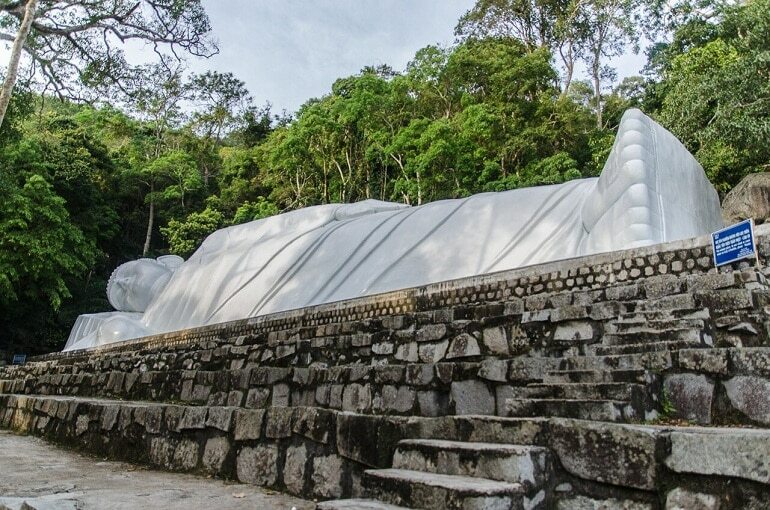 The statue is 49 meters long and 11 meters high, and classified as a national cultural and historical site. A large number of tourists as well as Buddhists come here to visit and lighten the incense in order to worship the Buddha. Also, you will have an opportunity to pray for good luck, happiness, and peace for the family while visiting this pagoda. There are many stone and wooden chairs for tourists to sit and enjoy the sacredness of the surrounding space. This is not only an alluring tourist sight, but also a National Nature Reserve due to its diversifying flora and fauna. Many rare species of animals which is listed in the World Red Book are found in this area, namely Cyrtodactylus takouensis lizard, Gekko rock lizard, black leg douc, Truong Son (Annamite) silver langur,… and more than 150 medicinal plants. If you have a chance to visit this mountain the spring, you can admire the fragrant flowers that bloom all over the forest. However, in general, Ta Cu Mountain is a sacred place so you should not wear shorts or short skirts when coming here. What To Eat In Ta Cu Mountain? A number of restaurants are located at the foot and in Ta Cu Mountain, so you can easily choose one of them. The restaurants located at the foot of the mountain serve a variety of dishes such as rice, seafood, hot pot dishes, vegetarian dishes, European and Asian dishes, and national cuisine. 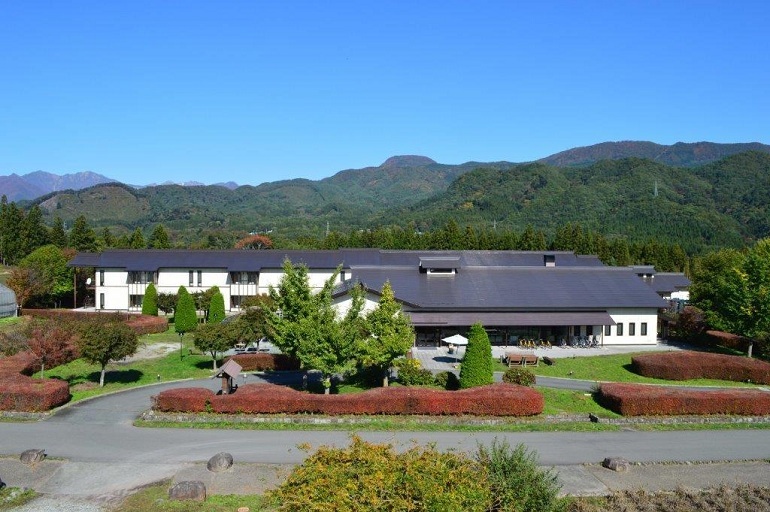 The restaurants in the mountain are surrounded by forests, mountains, and mild air. They also serve a variety of dishes, from casual to luxury. Adult: Roundtrip ticket: 100.000 VND / person and one way ticket: 60.000 VND / person. Children: Roundtrip ticket: 60.000 VND / person and one way ticket: 40.000 VND / person. Rental price of fishing rod: 10.000 VND / fishing rod. Indeed, Ta Cu Mountain is one of the must-visit destinations when it comes to Phan Thiet tourism. Now is the time to depart and experience. Wish you have a great trip!